Case MOTHER-OF-PEARL DISPLAY CA990. Case has made a cherry wooden case that has a glass opening. It has a lock on the side and does come with a key. 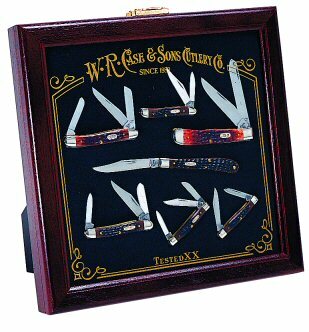 The glass has a Case logo and the W.R. Case and Sons Cutlery Co on the front. Inside is a black foam piece to hold your knives. Has two clips on the back so this can be hung on the wall. Case still makes this in the USA. Do you own Case Mother-of-pearl Display Ca990? Tell us about it! Have a question? Ask!